via Cage Contender VIII/YouTubeConor McGregor in 2011 after beating Mike Wood. Conor McGregor fought Mike Wood in the eighth professional fight of his career and won by TKO in 16 seconds. In a 2014 interview, Wood said he remembered about 14 seconds of getting hit with McGregor’s left hand. Wood said he knew he wasn’t cut out for UFC after seeing how good McGregor was. When Mike Wood took a fight against Conor McGregor in 2011 for Cage Contender VIII, he knew little about McGregor but had heard he was a talented puncher. McGregor had seven professional fights at that point in his career. Wood took the fight with just two days’ notice after a series of potential opponents for McGregor (who was not on the main card) dropped out for various reasons. 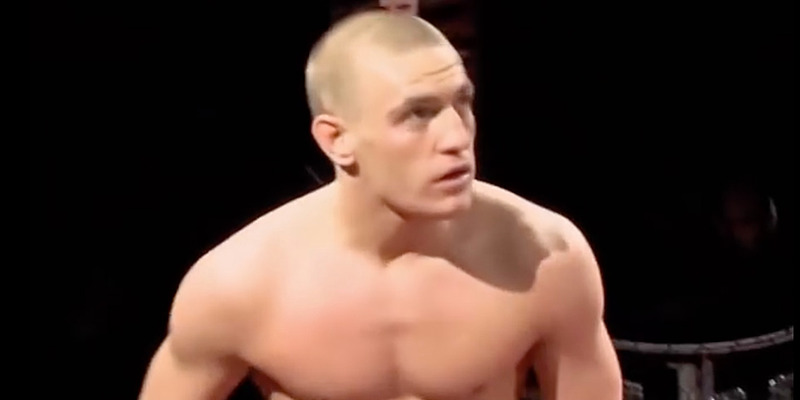 In an interview with Pete Carroll of Severe MMA in 2014, Wood said that he had dreams of trying out for Ultimate Fighter and needed three fights to do so. He was one shy and desperate for a third, so he took the fight with McGregor on short notice. Wood explained to Carroll how he remembers only a few seconds of the fight and how getting beaten by McGregor changed his overall career arc – to the point that he knew he wasn’t cut out for UFC. Early in the fight, McGregor evaded Wood on the ground, got on top of him, and began hitting him. The referees stopped the fight after 16 seconds, resulting in a McGregor win by TKO. The win moved him to 6-2 in his career. Wood told Carroll that his recollection of the fight was pretty brief. “Of the 16-second fight I think I can remember a good 14,” Wood said. “I think we double-touched gloves and then I just remember being hit five times, really f—ing hard. Wood said McGregor broke his orbital bone during the fight and followed up after the fight to see how he was. Via Cage Contender VIII/YouTubeIt didn’t take long for McGregor to beat Wood. Further, Wood said, he learned a valuable lesson after fighting McGregor – he wasn’t cut out for UFC. “I suppose the fight did have a knock-on effect on my career … As soon as I woke up inside the cage, I knew that I wouldn’t make it to that level.